"Constellation Mobile" by Alexander Calder (1943); wood, wire, string and paint; 53" x 48" x 35"
LACMA’s dazzling Alexander Calder retrospective is, unbelievably, the abstract sculptor’s first-ever solo Los Angeles museum exhibition. The 1943 “Constellation Mobile,” which you can see in the new LACMA exhibition Calder and Abstraction: From Avant-Garde to Iconic, exemplifies this interpretation of the cosmos as a realm of variously shaped astral bodies pursuing their peculiar course through space. Due to shortages of available metal during World War II, the whimsically designed objects hanging from the ceiling and painted in different colors are made of wood. As in most of Calder’s mobiles, the path these elements follow at any given time depends on the vagaries of the air currents in the area where they reside. 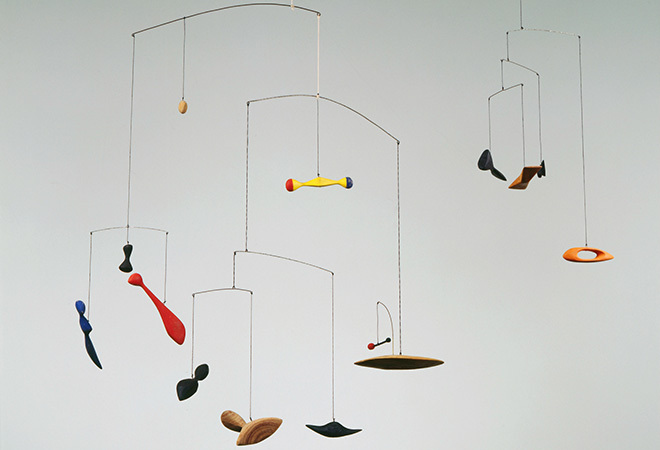 The sculptural form known as the “mobile” was invented by Calder in the early ’30s to describe the distinctive works he had designedwith multiple parts moving through space either pushed by a motor or under the capricious influence of the surrounding environment. (Some LACMA patrons have also been spotted puckering up and blowing at certain pieces in vain attempts to set them in motion.) A couple of decades later, Calder would coin the contrasting term “stabiles” to describe the sturdier metal structures he was creating as public works. Calder and Abstraction, which runs through the end of July, traverses four and a half decades of Calder’s career and contains almost 50 pieces beginning with his early wire sculptures and framed kinetic “panels” and continuing with a dazzling array of mobiles, some hanging from standing bases and others from the ceiling, as well as a couple of the powerful stabiles, or maquettes, from his mature period. Architect Frank Gehry has redesigned much of the interior of the museum’s Resnick Pavilion to provide a custom setting for what Marcel Duchamp once described as the “pure joie de vivre” emanating from Calder’s art. Although Calder has been an integral presence at LACMA since its opening in 1965, when the museum commissioned the “Three Quintains (Hello Girls)” outdoor fountain sculpture, this is, unbelievably enough, the first solo exhibition of his work ever mounted in Los Angeles. “Three Quintains” has since been transferred to its present location in the Director’s Roundtable Garden, where it serves as a perfect historical coda to this spectacular retrospective.